The morning of Mile End parkrun's 5th birthday started off with 'Coffee Mike' doing a 19 point turn in his coffee van in the tightest of spaces. He might still be there trying to manoeuvre his way out, if so, give him a wave! As parkrunners gathered in the cold and wet, our pacing team mostly from local running group Goodgym gathered to collect their pacing vests. Run Director for the day Craigie-Lee called upon our human megaphone Johnny to announce the briefing for new runners was about to take place. Johnny is a super mild mannered chap so to hear his booming voice echo around Mile End park probably came as a big surprise to many folks. The pacers then lined up in order for the traditional before-the-run photo. With nearly every minute covered between 17-35 there was potential for a lot of personal bests today. At the start Craigie-Lee announced that 63 runners completed the course on it's inaugural run on this day 5 years ago. Not keeping the runners out standing in the cold, she got the run underway quickly. It was really lovely to see the pacers dotted around the course during the run with small groups of runners in tow looking to break their pb's. Despite the rain there was lots of smiley faces on runners and volunteers. The first runner to finish was an unknown male, the second was James Maddison of Victoria Park Harriers who finished in 16:41. The first female finisher was Polly Skeates-Beswick of Goodgym running club who finished in 20:50. Both James and Polly broke their pb's! Great running both of you. 263 runners completed the course, exactly 200 more than this time 5 years ago. 51 of whom broke their pb's. Congratulations to you all. Nearly 50 first timers visited us today, we hope you all enjoyed the run, despite the weather! If you come back next week, there will be cake! 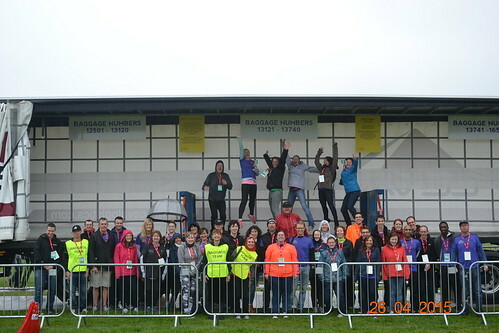 Well done to all the pacers who did a terrific job in helping runners break some personal records. Our volunteers for the day deserve a huge cheer as without them we would have no run and for Axel for being our photographer out on the course (http://www.parkrun.org.uk/mileend/photos/) and Claire and Frances for organising the pacers. We look forward now to next Saturday for part two of our celebrations….cake! Chris XENOS (SM30-34) (Unattached) was first over the line in 17:20 - third time in 9 appearances. Joe WILLIAMS (SM30-34) (Unattached) was second over the line in 17:28 - has been first to finish on 37 previous occasions. Paul BODDEY (VM35-39) of Eton Manor AC, was third over the line in 17:45 - was first to finish once before. Steve Arland SAWYER (Unattached) 100 pts. Johnny FLAHAVAN (Unattached) 100 pts. 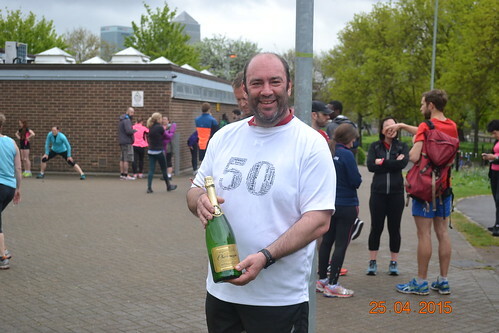 Richard CHERRETT (Victoria Park Harriers & Tower Hamlets AC) 100 pts. Helen PALMER (SW25-29) (Unattached) was first (13th overall) over the line in 19:34 - 29th time in 31 appearances. Marie NOTERMANS (SW20-24) (Unattached) was second (17th overall) over the line in 19:50 - has been first to finish on 3 previous occasions. Clare NORRIS (VW35-39) (Unattached) was third (53rd overall) over the line in 21:59. Craigie-Lee PATERSON (Women Running at E14) 100 pts. Helen PALMER (Unattached) 100 pts. Carole BOYLE (Women Running at E14) 100 pts. Greg PENN (VM50-54) was graded 82.38% for the time 18:21 (5th overall). Paul BODDEY (VM35-39) was graded 75.77% for the time 17:45 (third overall). Helen PALMER (SW25-29) was graded 75.64% for the time 19:34 (13th overall). This week there were 206 runners, of whom 33 were first timers and 32 recorded new Personal Bests. Representatives of 19 different athletics clubs took part. Mile End parkrun started on 4th February 2012, and since then 4,392 different runners, including participants from 454 athletics clubs, have completed 22,853 runs covering a total distance of 114,265 km, and there have been 4,337 new Personal Bests. The female record is held by Kathyrn PENNEL who ran in a time of 00:17:44 on 2013-07-27 (event number 78). The male record is held by Paul MARTELLETTI who ran in a time of 00:14:49 on 2013-08-17 (event number 81). The Age Grade course record is held by Ros TABOR who recorded a 94.20% run (21:51) on 9th May 2015 (event number 171). Today's full results and a complete event history can be found on the Mile End parkrun Results Page. David JONES (SM30-34) of Victoria Park Harriers & Tower Hamlets AC, was first over the line in 16:33 - 8th time in 74 appearances. Harold WYBER (SM30-34) of Woodford Green AC with Essex Ladies, was second over the line in 16:41 - has been first to finish on 2 previous occasions. Javier GOMEZ (SM20-24) of Serpentine RC, was third over the line in 17:45. Joe WILLIAMS (Unattached) 3376 pts. Alexander James FERRABY (Unattached) 2757 pts. Stephen PHILLIPS (Unattached) 2634 pts. Mary WESTERN (VW50-54) of Carnegie Harriers, was first (17th overall) over the line in 19:42 - first appearance. Rachel COUPE (VW45-49) of Telford AC, was second (20th overall) over the line in 19:58. Charlie LADYMAN (SW30-34) of Victoria Park Harriers & Tower Hamlets AC, was third (41st overall) over the line in 21:22 - has been first to finish on 3 previous occasions. Christina EASON (Victoria Park Harriers & Tower Hamlets AC) 3979 pts. Victoria O'SULLIVAN (Serpentine RC) 3662 pts. Tracey TAYLOR (Unattached) 3626 pts. Mary WESTERN (VW50-54) was graded 88.41% for the time 19:42 (17th overall). Rachel COUPE (VW45-49) was graded 79.55% for the time 19:58 (20th overall). David JONES (SM30-34) was graded 78.55% for the time 16:33 (first overall). This week there were 178 runners, of whom 31 were first timers and 24 recorded new Personal Bests. Representatives of 24 different athletics clubs took part. Mile End parkrun started on 4th February 2012, and since then 4,330 different runners, including participants from 450 athletics clubs, have completed 22,461 runs covering a total distance of 112,305 km, and there have been 4,280 new Personal Bests. The first Saturday of 2016 was the first parkrun of the year for many but not for everyone, as a number of (fool!?) hardy runners had taken the opportunity to visit one of the New Years day parkruns that were organised up and down the country. Some even did two back to back parkruns yesterday! Various Mile End parkrun regulars headed up to Oak Hill park run (visit Mile End parkrun’s facebook page to see some familiar faces striking some funky poses https://www.facebook.com/mileendparkrun). Back in the East End on parkrun Saturday, the first Mile End parkrun of the year was met with cold and wet conditions, but luckily it wasn’t raining by the time the run started. It was really great to see so many runners and many first timers too. It would have been very easy to put it off for a week and blame the Christmas indulgence or the weather on a no show. There were lots of new faces at Mile End today and the furthest came from Brisbane, Australia. During the newcomer’s runners briefing after describing the course, the first timers were told not to worry about getting lost as speedy Mile End regular Joe is here and he would lead everyone out and that everyone would just follow him. A giggle was raised when it was mentioned what if he himself gets lost! Two runners achieved their 100 parkrun milestones today, Ben who effortlessly runs pushing his buggy and young baby (thank you for the Haribo’s Ben! the runners loved them) and our regular parkrun junior Maddy. Congratulations Ben and Maddy, we look forward to seeing you run in your ‘100’ t-shirts. 110 runners completed the 5k course today, burning off approximately 300 mince pies, 15 kilos of Brussel sprouts and 4 bottles of sherry. 12 runners achieved a personal best too, so their celebratory drinks might need to be burnt off again next Saturday. Do visit again and break those pb’s! The full breakdown of today’s placings can be found below. It’s our fourth anniversary in February so please join us on February 6th for a celebratory run. Joe WILLIAMS (SM30-34) (Unattached) was first over the line in 17:00 - 36th time in 118 appearances. Matthew TIMMS (SM25-29) (Unattached) was second over the line in 18:30. Theodore CODE (SM25-29) (Unattached) was third over the line in 18:43. Joe WILLIAMS (Unattached) 3276 pts. Stephen PHILLIPS (Unattached) 2437 pts. Rachel THOMAS (SW30-34) of Victoria Park Harriers & Tower Hamlets AC, was first (12th overall) over the line in 20:55 - 13th time in 26 appearances. Chiara BORG (SW25-29) (Unattached) was second (20th overall) over the line in 21:59. Szymirska ANNA (SW30-34) (Unattached) was third (24th overall) over the line in 22:34. Christina EASON (Victoria Park Harriers & Tower Hamlets AC) 3798 pts. Victoria O'SULLIVAN (Serpentine RC) 3411 pts. Tracey TAYLOR (Unattached) 3364 pts. Valerie DESBOROUGH (VW55-59) was graded 77.55% for the time 23:59 (40th overall). Joe WILLIAMS (SM30-34) was graded 76.08% for the time 17:00 (first overall). Ruby NAUGHTON (JW10) was graded 72.93% for the time 23:24 (32nd overall). This week there were 110 runners, of whom 11 were first timers and 12 recorded new Personal Bests. Representatives of 16 different athletics clubs took part. Mile End parkrun started on 4th February 2012, and since then 4,225 different runners, including participants from 445 athletics clubs, have completed 21,846 runs covering a total distance of 109,230 km, and there have been 4,201 new Personal Bests. Thanks to all the volunteers who have made this event possible. There is now a club tshirt for volunteers. A lovely purple t-shirt gained after volunteering at 25 events. Spookily they are all RDs but I can guarantee all judging is done blind. Thanks to Paul and Nita for judging - I'm sure it was tough. Next year we are looking at introducing categories - more details nearer the time. Well not the almost record breaking turnout we had a last week but a great show with running tourists and Jane Oswell’s dad who came all the way from Australia to be finish token support allowing Jane to run. The volunteer rota is looking very full for the next couple of weeks but there are lots of slots in August. Helping is a good way to stay in touch if you are injured or have a race the next day. And as an added incentive there is a free volunteer Tshirt after 25 stints. The shirt was modelled by Craigie Lee and Carole this week. It’s a busy couple of weeks coming up at Mile End with Scott Summers 18th birthday celebration on the 18th July. Little did his dad Mike realise when he took up the offer to provide coffee on a Saturday morning that it would turn into a family affair with mum Jocelyn and Scott signing up for their first 10k on the 19th July and the Summers completing 216 parkruns between them. Come and celebrate with cake and buy some coffee from Mike. The following week, 25th July there is a pacing event: we need volunteers to pace a range of times from 18 minutes to 35. So far we have runners for 18 Joe, 20 Neil, 21 Alex, 22 Johnnie, 23 Steven , 25 Jane , 26 Soraya, 30 Carole and 35 Claire . Just email if you fancy running any of the times in between. Then on Wednesday 29th is the first ever Mile End pub quiz at the Palm Tree at Bow 7.30 for a 8.00pm start. There will be prizes for the winning team and a raffle. The prizes are funded from our donations including the London Marathon for our efforts with the baggage. For more info about our donations see http://www.parkrun.org.uk/mileend/aboutus/. Come along and test your parkrun knowledge. There will be plenty of time for drinking and chatting too. Joe WILLIAMS (SM25-29) (Unattached) was first over the line in 16:52 - 27th time in 105 appearances. Ben PUGH (SM25-29) (Unattached) was second over the line in 17:21. Horace ORMSBY (SM18-19) (Unattached) was third over the line in 18:33. Joe WILLIAMS (Unattached) 1986 pts. Ben PUGH (Unattached) 1393 pts. Alexander James FERRABY (Unattached) 1371 pts. Cas WRIGHT (SW20-24) of London Heathside Runners AC, was first (15th overall) over the line in 19:39 - second time in 2 appearances. Rachel THOMAS (SW25-29) of Victoria Park Harriers & Tower Hamlets AC, was second (49th overall) over the line in 22:45 - has been first to finish on 11 previous occasions. Charlie LADYMAN (SW30-34) of Victoria Park Harriers & Tower Hamlets AC, was third (51st overall) over the line in 22:50 - has been first to finish on 2 previous occasions. Tracey TAYLOR (Unattached) 1705 pts. Christina EASON (Victoria Park Harriers & Tower Hamlets AC) 1613 pts. Soraya BEN MANSOUR (Victoria Park Harriers & Tower Hamlets AC) 1558 pts. Joe WILLIAMS (SM25-29) was graded 76.58% for the time 16:52 (first overall). John MOORE (VM45-49) was graded 75.98% for the time 18:40 (5th overall). Jerry LOCKSPEISER (VM60-64) was graded 75.60% for the time 21:35 (38th overall). This week there were 161 runners, of whom 20 were first timers and 27 recorded new Personal Bests. Representatives of 19 different athletics clubs took part. Mile End parkrun started on 4th February 2012, and since then 3,604 different runners, including participants from 388 athletics clubs, have completed 17,970 runs covering a total distance of 89,850 km, and there have been 3,571 new Personal Bests. to participate in other running events up and down the country. attracted over 3,000 runners who between them have completed 14,500 runs. the family have run the course at least 100 times. 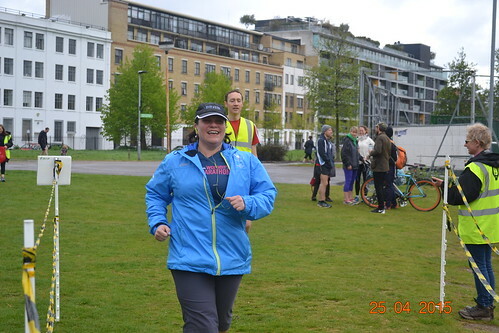 has gone on to complete a half marathon and joined a local running club, WomensRunning@E14. Well what a weekend The rain certainly didn't put anyone off. We had a record turn out of 200. As usual the parkrun fairies did their work and the rain stopped by 9am but at 8.30am this didn't seem likely. Whilst huddling outside Mile End stadium we were joined by some IPC athletes who were there to undertake readiness tests for the marathon. Among the runners we had visitors from Basingstoke, Leeds, Bradford and New York to name but a few. Sunday saw 50 Mile Enders heading to Blackheath to help with the start baggage. We manned 5 lorries and calmed the nerves of many a first timer as well as high fiving friends. We'll be back next year so look out for messages nearer the end of the year. Once the baggage lorries were safely on their way to the Mall we headed to the 16.5 mile point on the course, attached the parkrun flag to a lamppost and spent several hours cheering on the runners. We managed to see our baggage ballot place winners Simon (3:56:10) and Annabel (4:24:36). I also saw Matthew Button and Sue Wade. Well done to all parkrunners who completed the marathon. There were Personal Bests (PBs) galore, at Mile End, on Saturday morning. Nine of the first 17 finishers achieved that magical feeling of running the course quicker than they have ever run it before. In fact, 46 of the 165 finishers (28%) set a new PB. First across the line was Joe Williams. Although he wasn’t one of those to set a new PB, he did equal his PB, which he only just set a week previously. To run this PB time two weeks in a row certainly suggests there’s plenty more progress to come for Joe. Since the start of the year, he’s set three new PBs, and equalled his PB on two other occasions. Joe said he’s changed his training a bit, and actually reduced the amount of mileage he’s doing, but increased the intensity of some of it. It certainly seems to be working well for him. Another winner who certainly followed a program of limited mileage was, in my opinion, the greatest British athlete, ever. Yes, indeed, Seb Coe never ran more than 50 miles in a week. Seb is the only man to defend the Olympic 1500m title, and his 800m World Record stood for 18 years. Talking of World Records, very nearly 12 years ago, Paula Radcliffe (the greatest female (again, in my opinion)) ran the fastest-ever time by a woman for the Marathon. Her record of 2:15:25 may well stand for another 12 years. She’s due to be running the London Marathon, on the 26th of April, as her final goodbye to racing. 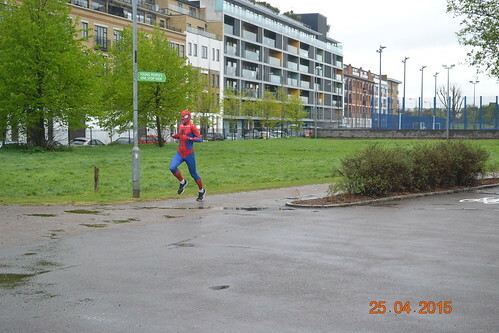 Perhaps some of the Mile End Parkrunners are also running. What a thrill to be in the same race as this utterly fantastic athlete. Joe WILLIAMS (SM25-29) (Unattached) was first over the line in 16:36 - 20th time in 95 appearances. Adam Alexander YOUNG (SM30-34) (Unattached) was second over the line in 16:44. David JONES (SM30-34) of Victoria Park Harriers & Tower Hamlets AC, was third over the line in 16:59 - has been first to finish on 5 previous occasions. Holly PAGE (SW25-29) of Cambridge University Hare and Hounds, was first (20th overall) over the line in 19:42 - third time in 3 appearances. Miranda JOHNSON (SW20-24) (Unattached) was second (41st overall) over the line in 21:32. Grace MILLER (JW11-14) of Victoria Park Harriers & Tower Hamlets AC, was third (48th overall) over the line in 22:12.